Dr. Kelly received his M.D. degree from the University of Rochester School of Medicine and Dentistry. He has completed a neurology residency and a Vascular Neurology (Stroke) Fellowship, both at Rochester. He is currently an Associate Professor of Neurology at URMC and Director of the New York State Primary Stroke Center at Highland Hospital. He has research interests in improving quality of care for stroke patients, medical decision making in severe stroke, and neurology resident education. 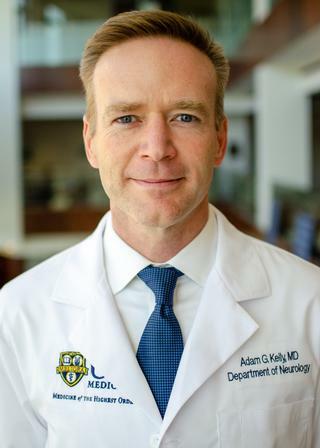 His career interests have been focused on improving the quality of care for stroke patients, and the Women's Neurology Clinic will ensure that the unique aspects of caring for women with cerebrovascular disease will get the attention they rightly deserve. Hwang DY, George BP, Kelly AG, Schneider EB, Sheth KN, Holloway RG. "Variability in Gastrostomy Tube Placement for Intracerebral Hemorrhage Patients at US Hospitals." Journal of stroke and cerebrovascular diseases : the official journal of National Stroke Association.. 2018 Apr 0; 27(4):978-987. Epub 2017 Dec 06. Opaskar A, Scharf EL, Chilungu MW, Kelly AG. "Transgender venous thrombosis." Neurology. Clinical practice.. 2017 Dec 0; 7(6):531-533. Chandler JV, George BP, Kelly AG, Holloway RG. "For-Profit Hospital Status and Carotid Artery Stent Utilization in US Hospitals Performing Carotid Revascularization." Stroke.. 2017 Nov 0; 48(11):3161-3164. Epub 2017 Sep 22.